In Colorado, timberline -- the boundary between forest and tundra -- falls between 11,000 and 11,500 feet above sea level. The alpine environment is harsh, with high winds, short summers, heavy snows and extremely cold temperatures. Wildlife must be hardy and well-adapted to survive in this habitat. With more than 50 mountains reaching above 14,000 feet, Colorado features abundant tundra habitat for these species. Numerous small mammals live above timberline, eating alpine grasses, flowers and seeds. In Colorado, pikas exist only at elevations of 11,000 feet or higher, where they occupy boulder fields, rockfalls and stone-strewn hillsides. These rabbit relatives don’t hibernate, but they shelter beneath the snow, where their thick coats and fur-covered paws help them stay warm. Yellow-bellied marmots often occupy the same tundra habitat as pikas, though at lower elevations. 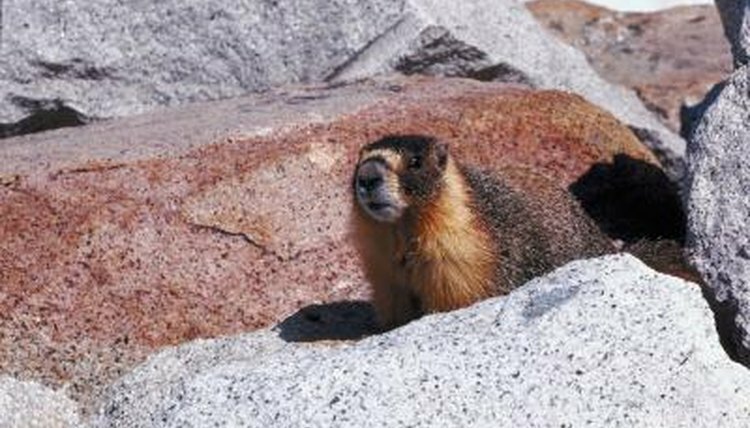 During the winter they hibernate in burrows beneath rocks, but in the summer they bask on sun-warmed stones and forage for food. Other small mammals that might live above timberline in Colorado include ground squirrels, least chipmunks, pocket gophers, snowshoe hares, wood rats and voles. White-tailed ptarmigan, a type of grouse, live near or above timberline. They nest in krummholz, groves of twisted or stunted trees, such as those that sometimes grow near the tree limit. During the winter, these birds retreat to slightly lower elevations, but they summer in alpine areas near snow fields. Sensitive to temperatures above 70 degrees Fahrenheit, white-tailed ptarmigans cover themselves with snow to cool off on hot days. Their plumage varies from white during the winter to brown and gray in the summer. Other birds sometimes found above timberline include species of falcons, finches, larks, ravens and sparrows. Both short- and long-tailed weasels, whose fur changes from brown to white for the winter, can live above the tree limit. Badgers, who prefer open spaces to forest, sometimes also establish territories above timberline. Versatile predators such as coyotes and mountain lions -- who prey on mountain goats and other large mammals -- might also venture onto the tundra in search of prey. Lynxes inhabit subalpine forests and venture above timberline in pursuit of snowshoe hares, their preferred prey. Once extinct in Colorado, they have been reintroduced successfully in remote parts of the high country. Wolverines also live above timberline. Until 2009, these large weasels were considered extinct in Colorado. Sightings, while rare, have been reported in remote, alpine areas. Bighorn sheep, able to jump and climb across sheer cliffs, inhabit Colorado’s high country. While they might venture to lower elevations during winter, they often spend the year in alpine regions. They grow dense double layers of fur for the cold months and shed their heavy coats for summer. Mountain goats, an introduced species in Colorado, also live above timberline, where their shaggy white coats provide camouflage and help protect them from the elements. Elk herds and male mule deer sometimes venture above timberline during the summer. The fragile alpine grasses provide them grazing fodder; when the snows begin, these animals move back to lower elevations where food is more abundant.